This Wardway Mount Vernon was built in the spring of 1927. Actually, it might not be a Mount Vernon, but an identical twin house offered by the Gordon-Van Tine Company called the Cabot. The best way to tell would be to get inside the house and look for marked lumber. The Cabot from Gordon-Van Tine. Same house, different names. The Gordon-Van Tine Company of Davenport, Iowa built catalog homes. From 1917 to 1932, Montgomery Ward subcontracted Gordon-Van Tine to manufacture its Wardway homes. After 1922, Gordon-Van Tine and Montgomery Ward offered identical homes for sale in their catalogs, although the naming differed. So the Wardway Mount Vernon from 1927 is identical to the Gordon Van-Tine Cabot. Based on the number of Wardway homes in this area, I'm going with Montgomery Ward as the manufacturer, just for simplicity's sake. The Mount Vernon was sold in the years 1927-1931. It was a very popular model for Wards. 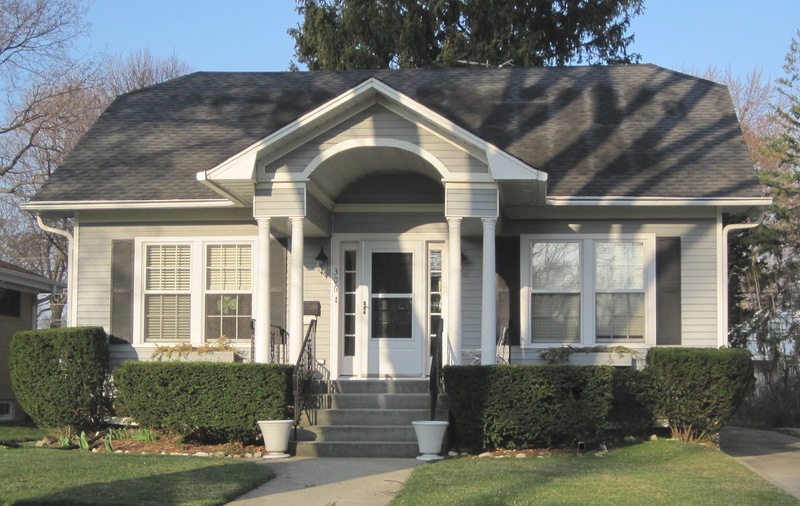 It's a Colonial bungalow with a dramatic center entrance covered by a carved pediment with twin Doric columns on either side. Two distinguishing features of the Mount Vernon are the multi-paned sidelights and the clipped-gable roof. The original flower boxes remain intact. This house is lacking the fireplace and the medallion decoration above the front door. Both of these are common modifications. The original owner was George E. Zirkelbach. He and his family moved to Mount Prospect in the spring of 1927 and occupied the home on Edward Street. George was an assistant comptroller of the Colgate-Palmolive-Peet company in Chicago. In 1932, George died at age 38 of an infected gallbladder. 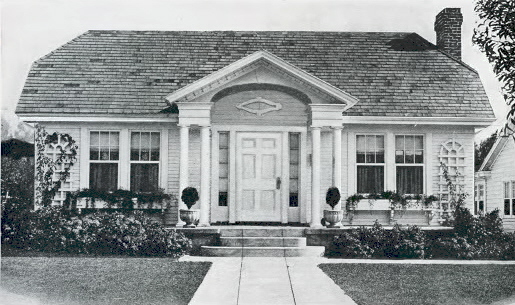 The Zirkelbach family soon moved out of the house, and rented it to the Wilder family in 1933. The Wilder family consisted of William Halsey (father), Hazel Wilder (mother), Roger Wilder (son), Nelson Budd (son), and Dorothy (daughter). They did not live on Edward Street very long. Hazel Wilder died suddenly of a heart ailment in February 1934 and the remaining family moved back to Chicago at the end of the year. The Widow Zirkelbach sold the home to Norman and Florence Humphries (and daughter Helen) in 1937. Florence Humphries died in 1958 (not in the home) and Norman continued to live in the house. In 1967, Mr. Humphries died in the bathroom in a fire at age 92. Norman was a very popular resident on South Edward Street. Even into his 90's, he tended his garden and did all his own housework. In 1968, Jim and Grace Schmit moved in. They lived in the house until 2003. Right before the house was sold in 2003, a tree fell on it! According to the Daily Herald, "a towering, 40-foot maple tree next to the driveway split. A 2-foot-long limb pierced the left side of the roof above the bathroom." According to the same article: "The house on Edward Street in Mount Prospect is a 76-year old Sears catalog house." I guess we can't expect the reporter to get everything right.